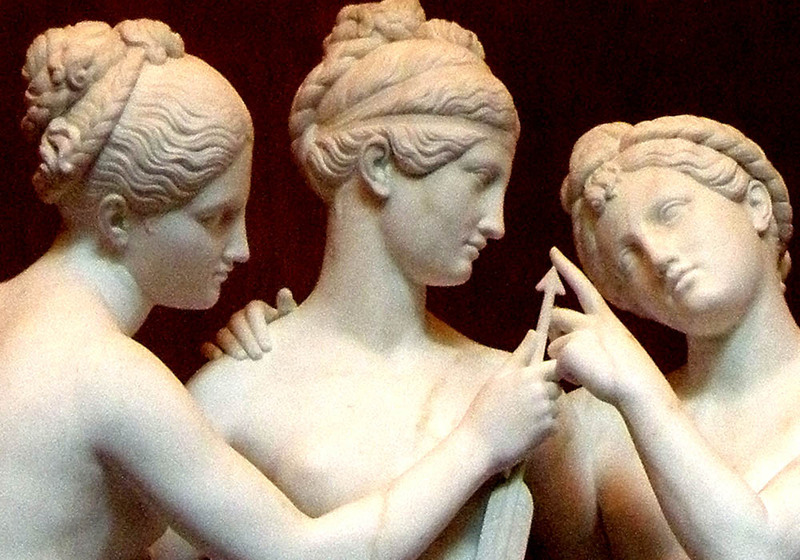 Canova remained the model for every sculptor of ambition for most of the nineteenth century. Yet the Napoleonic era was not a propitious one for sculptors who wanted to be like him: independent, beholden to no single patron, free to create "modern classics." 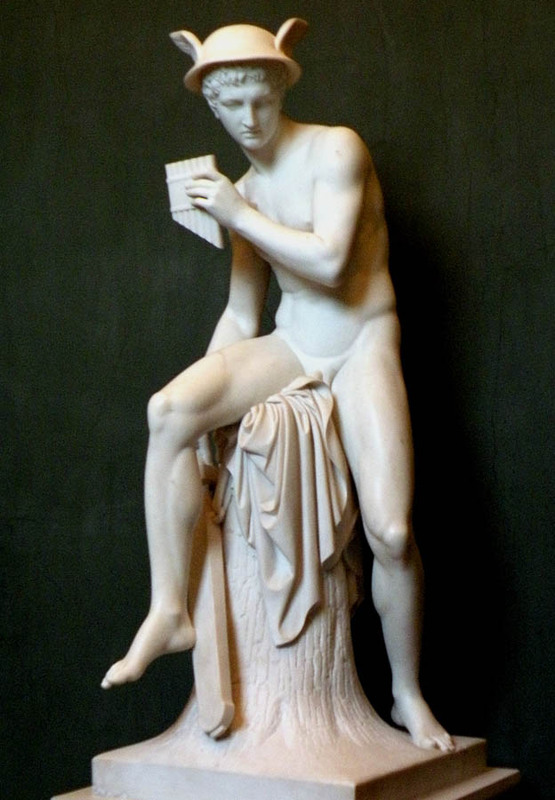 The only one who succeeded, and the sculptor on whom Canova's mantle ultimately descended, was Bertel Thorvaldsen (1770-1844), a Dane who came to Rome in 1797 on a scholarship from the Royal Academy in Copenhagen. Although he established his reputation early, he had to live through some difficult years before he could feel artistically and financially secure. 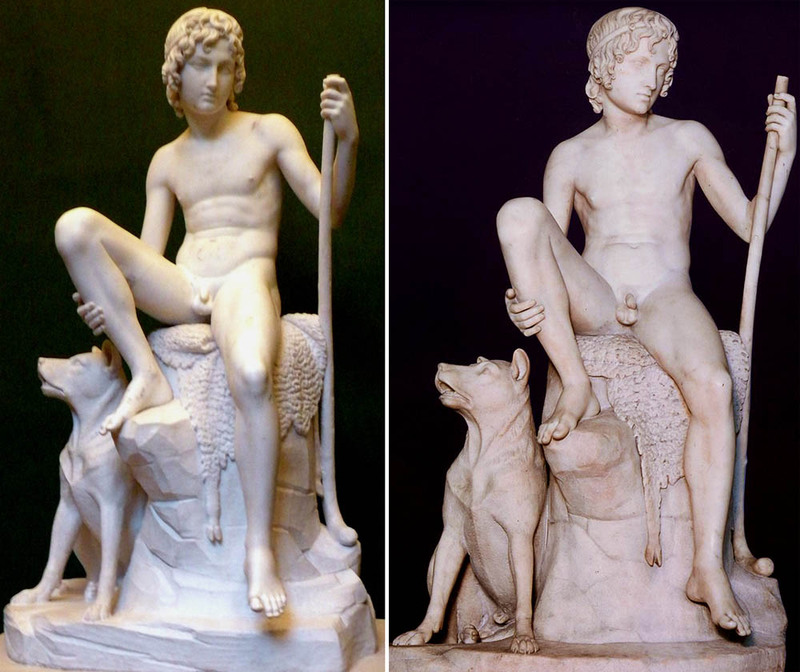 Thorvaldsen became the first to revive the most heroic phase of Greek art, but soon underwent a basic change not only of style but of outlook. 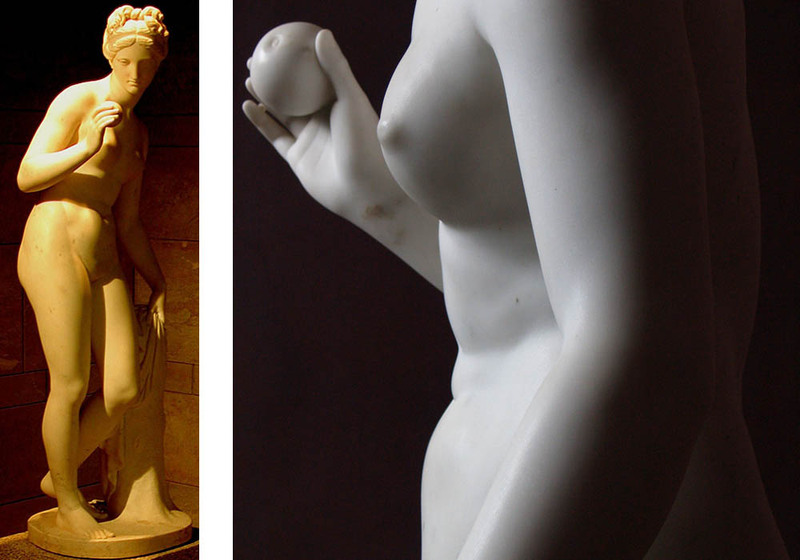 His Venus with Apple (fig. 918) is closer to a living model than to any ancient source, though its immediate precedent is a statue by Houdon. 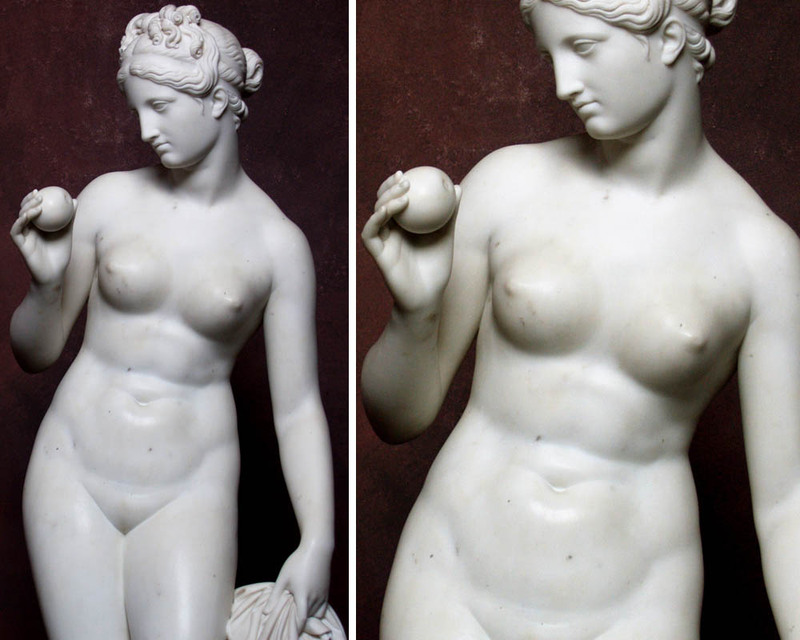 Thorvaldsen shows her in a moment of triumph, holding the golden apple awarded by Paris in the beauty contest that started the Trojan War, yet she contemplates the apple in a way that might lead us to mistake her for an Eve tempted, were it not for the garment in her left hand. The statue shows Thorvaldsen's new emphasis on poetic sentiment, as well as his reawakened religious feeling, which he shared with the young German painters in Rome known as the Nazarenes, many of whom were his friends. 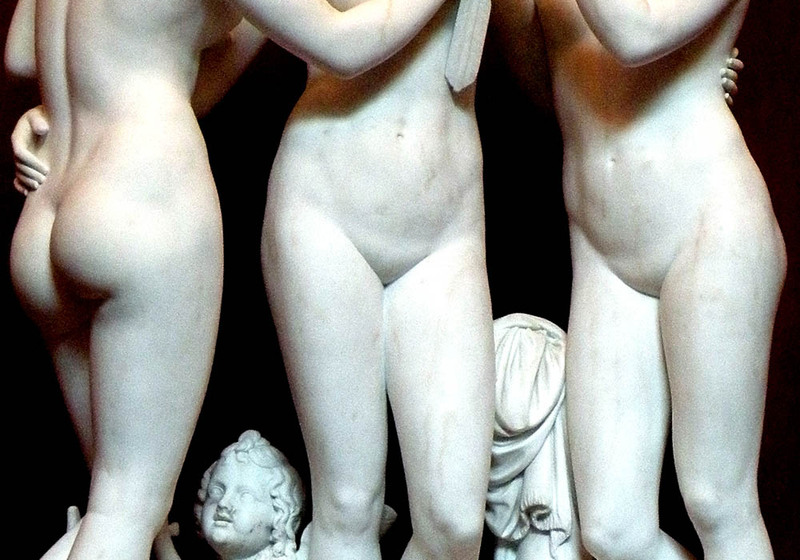 Thus his Venus is far more Romantic than Neoclassic, despite its style. 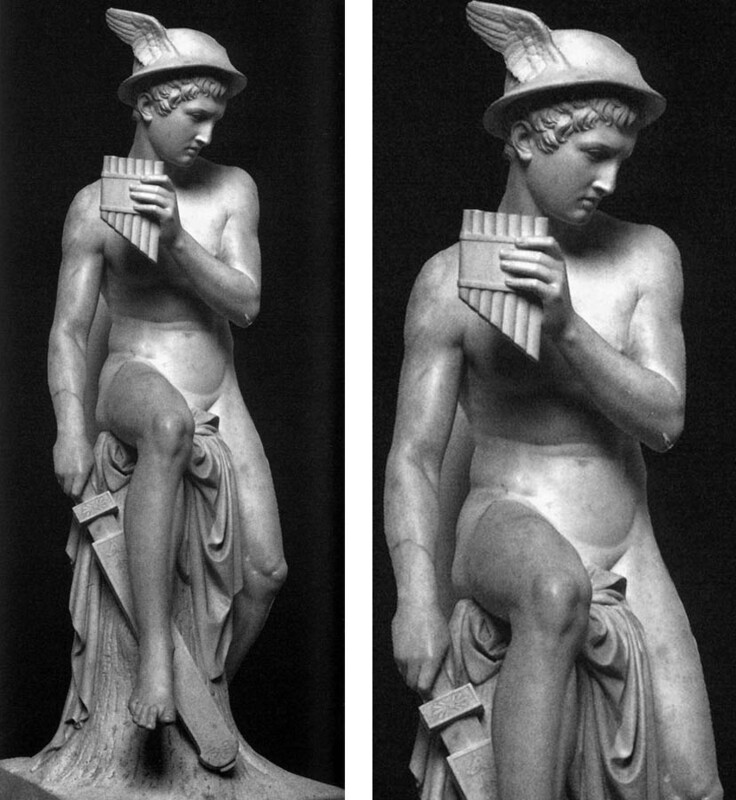 For all of Europe except France and Spain, Thorvaldsen remained the model of sculptural perfection until the 1850s. 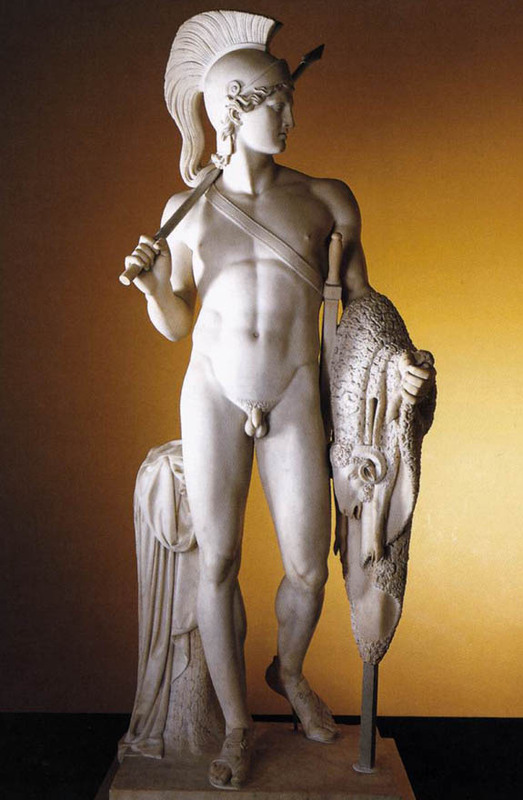 Germans, Scandinavians, and many Italians viewed him as more "truly Greek" than Canova, and for the English he became the heir of John Flaxman as well. 918. 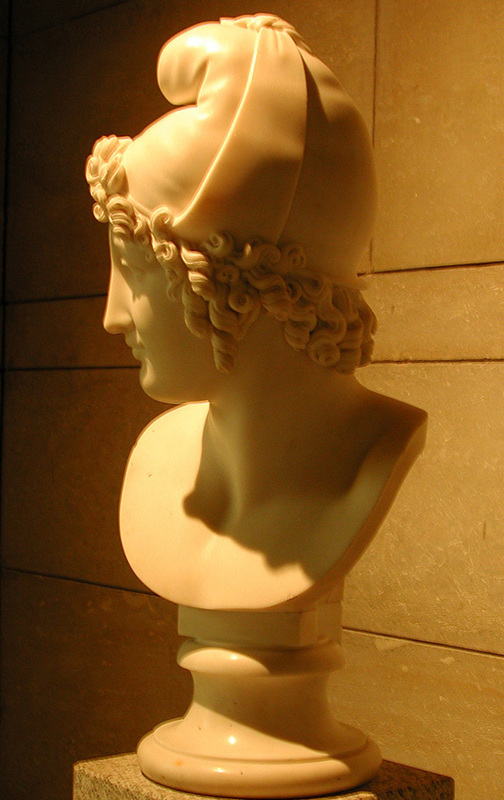 Bertel Thorvaldsen. 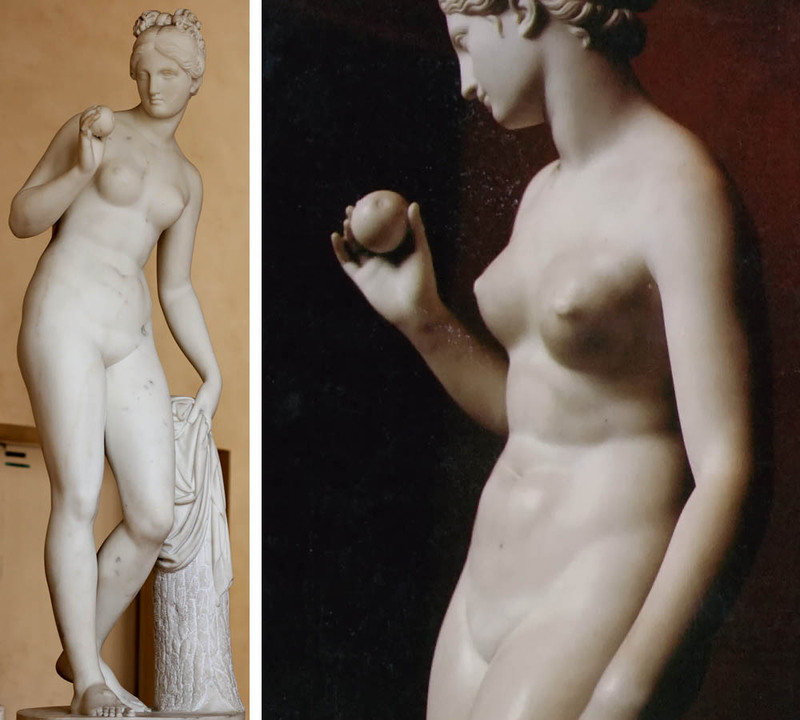 Venus with Apple. 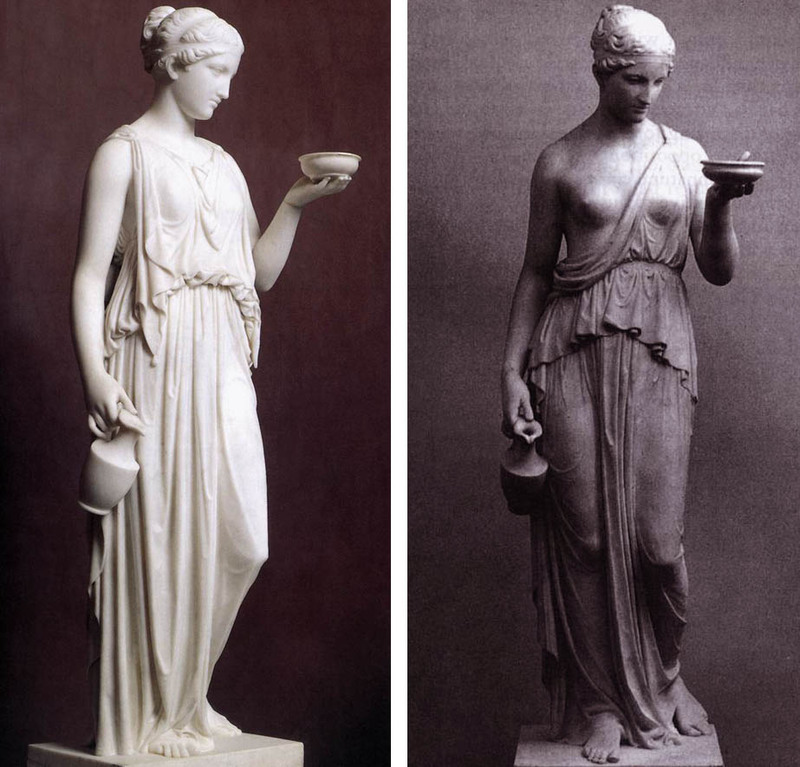 Bertel Thorvaldsen, Thorvaldsen also spelled Thorwaldsen (born Nov. 19, 1770, or Nov. 13, 1768, Copenhagen, Den.�died March 24, 1844, Copenhagen), sculptor, prominent in the Neoclassical period, who was the first internationally acclaimed Danish artist. Prominent in Roman intellectual and artistic circles, he influenced many emerging artists from Europe and the United States. 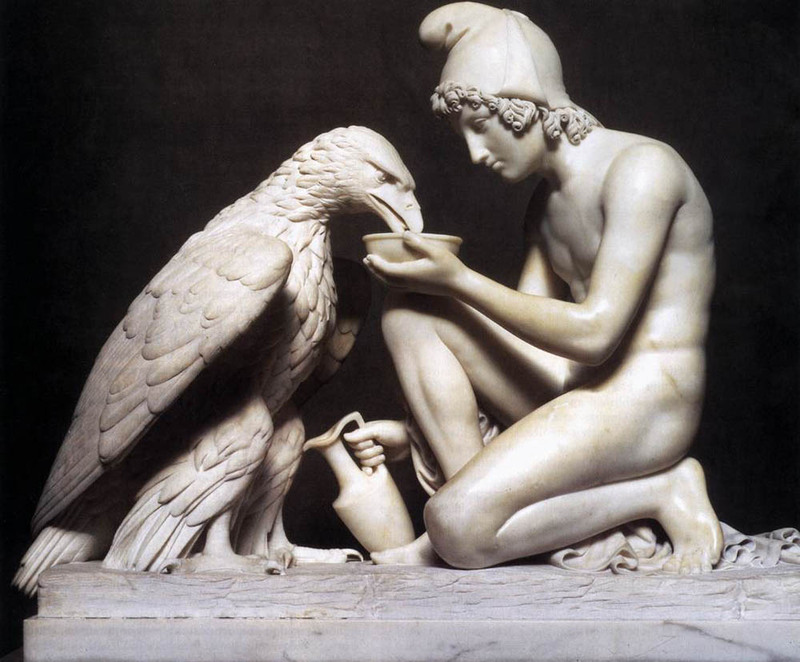 Thorvaldsen was the son of an Icelandic wood-carver who had settled in Denmark. 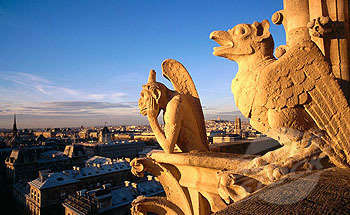 He studied at the Copenhagen Academy and won a traveling scholarship to Rome, where he was to live most of his life. 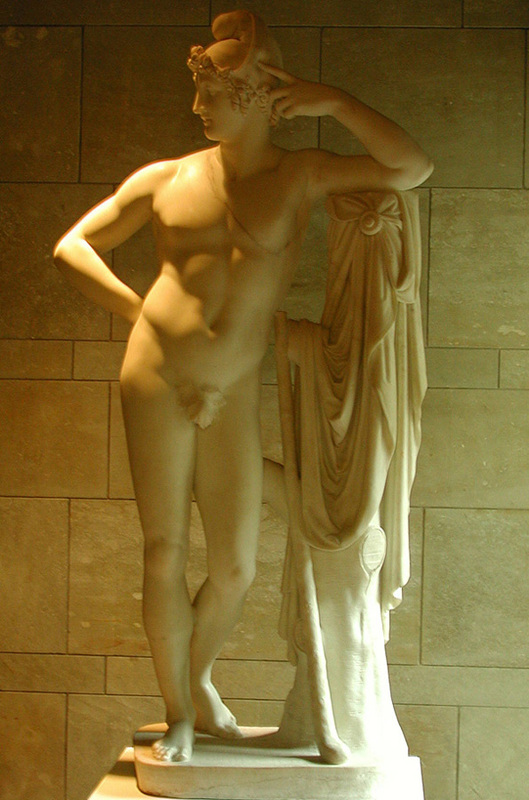 In Italy the prevailing enthusiasm for classical sculpture fired his imagination so much that he later celebrated the date of his arrival in 1797 as his �Roman birthday.� The success of Thorvaldsen�s model for a statue of Jason (1803) attracted the attention of the Italian sculptor Antonio Canova and launched Thorvaldsen on one of the most successful careers of the 19th century. When he returned to visit Copenhagen in 1819, his progress through Europe, in Berlin, Warsaw, and Vienna, was like a triumphal procession. His return from Rome in 1838, when he eventually decided to settle in Copenhagen, was regarded as a national event in Danish history. 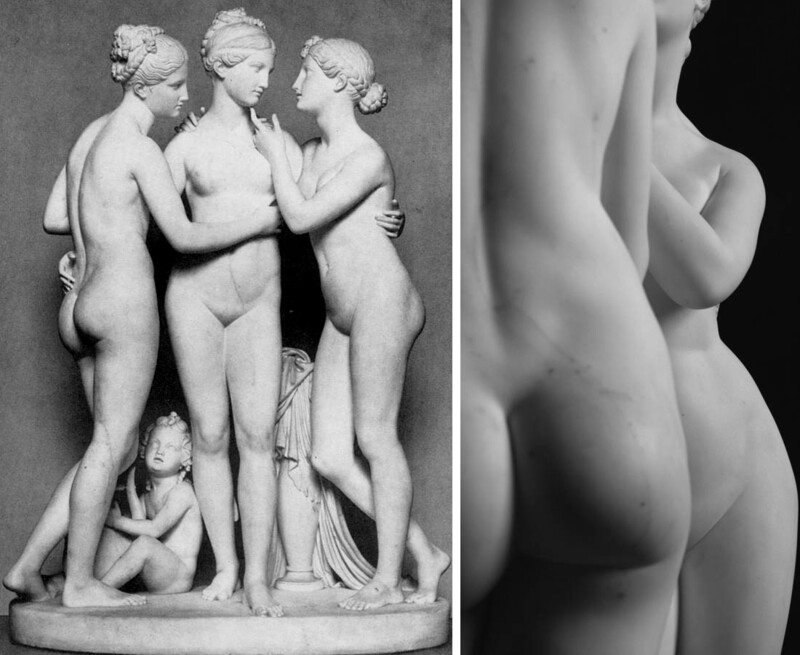 A large portion of his fortune went to the endowment of a Neoclassical museum in Copenhagen (begun in 1839), designed to house his collection of works of art, the models for all his sculptures; by his own wish, Thorvaldsen was to be buried there. 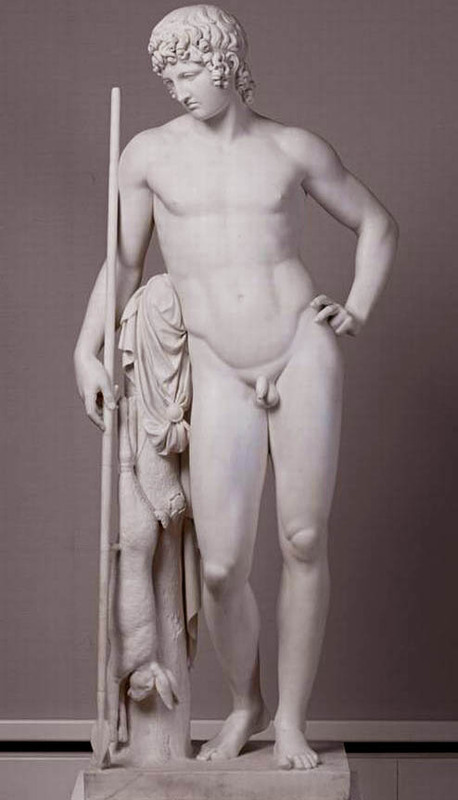 Most of Thorvaldsen�s most characteristic sculptures are reinterpretations of the figures or themes of classical antiquity. The Alexander frieze of 1812 in the Palazzo del Quirinale, Rome, modeled in only three months in anticipation of a visit by Napoleon, is an example of the feverish energy with which he could at times work. Religious sculptures include the colossal series of statues of Christ and the Twelve Apostles (1821�27) in the Vor Frue Kirke in Copenhagen. He also made numerous portrait busts of distinguished contemporaries.